It's now almost ten years since England's Steve Webster won the inaugural Portugal Masters in October 2007 and an Englishman has won the event in every alternate year since. It's always been staged at the Dom Pedro Victoria Golf Course (formally known as the Oceânico Victoria) and this will be the 11th renewal. We've seen numerous dramatic finishes but in ten previous renewals, there's never been a playoff. This year the tournament moves forward a month from its usual October slot in the schedule. An exposed course with water in play on seven holes - it's been the venue for this tournament from day one. The well-bunkered fairways are of an average width and the bentgrass greens are large and undulating. The rough is usually minimal and often not very punishing and that's going to be the case this year. In previous years they've closed the course for a few weeks to over-seed a ten metre strip of rough with ryegrass but they only closed the course a week last Monday. It's a resort course that the pros usually devour. The last two winners have amassed a 23-under-par winning score and in 2014 Alex Levy won in 18-under but they only played two rounds! Martin Kaymer shot 61 in the opening round of the very first staging, Scott Jamieson shot 60 in round three five years ago and Nicolas Colsaerts opened up the 2015 renewal with a 60 before Levy shot 61 in round two. It's a resort course and there's been no rain in the area for ages so the rough is minimal and the pros are going to lap it up again. With little wind forecast for Thursday or Saturday, expect some very low scores and maybe even the first sub-60 round on the European Tour. I'd favour length over accuracy but what you do off the tee here is largely irrelevant. 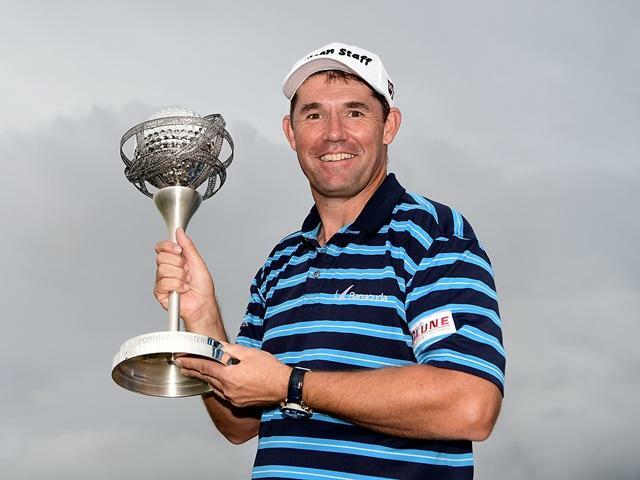 Last year's winner, Padraig Harrington, ranked 25th for Driving Distance and 49th for Driving Accuracy and when David Lynn won here in 2013 he ranked just 67th for DD and 70th for DA! In the ten years we've been coming here, only three players have ranked inside the top ten for Greens In Regulation - Sullivan ranked fifth in 2015, Lee Westwood ranked second in 2009 and Tom Lewis ranked fourth in 2011 but up until last year, the average ranking of all nine winners was only 15.77 so good iron play is clearly important but Pod managed to win last year ranking just 67th! He won because he putted better than anyone else (averaging just 25 a day) and he scrambled incredibly well too. And that's the number one indicator to look at. Harrington hit less than 70% of the greens in regulation last year. He missed 25 greens in total but took just 51 strokes in total - including two chip-ins and a holed bunker shot. This is basically a birdie-fest but as Harrington demonstrated in no uncertain terms, it's important to keep your round going when a green is missed and five of the last six winners have ranked first or second for Scrambling. The odd year out was 2012 but Michael Campbell, who finished third, ranked number one for Scrambling. Looking further back, the first three on the Scrambling stats finished inside the top-six in 2008 and at the inaugural event a year earlier, Peter Hanson ranked number one for it and he finished third. After Scrambling, the most important stats to focus on are Birdie Average and Par 4 Scoring. Harrington ranked second for Par 4 Scoring last year but the three winners before him all played the par fours better than anyone else and six of the ten winners to date have made more birdies than anyone else. Mikko Korhonen (tied third) was the only player in the field to record more birdies than Pod last year. Two courses that appear to correlate nicely are the Emirates, home of the Dubai Desert Classic, and Doha, the venue for the Qatar Masters. Harrington hasn't played in Dubai for a long time but he was second there back in 2001 and the 2015 winner, Sullivan, has finished second and fourth in two of the last three Dubai Desert Classics and he finished ninth in Qatar on debut in 2013. The 2014 winner, Levy, doesn't have any form at either course but the runner-up three years ago, Colsaerts, like Sullivan, has top-tens at both tracks and five of the first seven winners had plenty of form at both venues too. The 2013 winner, Lynn, who has since retired, was third in Dubai and he had back-to-back top-11 finishes in Qatar. In 2013 and 2014, the inaugural event winner, Webster, finished fourth and fifth in Qatar and seventh and fifth in Dubai. The 2009 winner, Westwood, has been runner-up at the Dubai Desert Classic three times and has twice finished inside the top-five in Qatar. Richard Green, successful here six years ago, has also won the Dubai Desert Classic and he has two top-four finishes in Qatar, and Alvaro Quiros, who is now based at Dom Pedro Victoria Golf Course, has won all three events. This is an event for outsiders. Harrington was matched at [130.0] before the off last year and he was the ninth big-priced winner in ten years. Sullivan was matched at [55.0] in 2015, Levy went off at around [80.0] the year before, Lynn was matched at [120.0] in 2013, Shane Lowry was another [80.0] chance and I was lucky enough to back Tom Lewis 12 months before that at a whooping [160.0] in 2011. Richard Green in 2010 and Steve Webster in 2007 were big outsiders and Quiros, in 2008, was yet another winner to go off at [80.0]. The only winner that was well-supported before the off was Westwood, in 2009, so don't be afraid to back a few outsiders this week. Harrington's no spring chicken but four of the last six winners have been in their 20s. If we disregard the misleading curtailed 36-hole event of three years ago, five of the other eight winners were within three of the lead and inside the top-five after round one. Pod was three adrift and tied for 12th. Having tied for the lead after rounds one and two, Lynn dropped to six off the pace and a tie for 16th after a disappointing 73 in round three, but he shot 63 to win by one and the two winners before him had both trailed by four with a round to go. Green had been an incredible seven adrift before going on to win by two strokes in 2010 and other than Sullivan, who was five clear after 54 holes, Quiros is the only third round leader to go on to win, so taking on the leaders after the third round could be the way to go. If you're betting in-running, the final four holes offer up two good birdie chances and two tough holes. The drivable par four 15th and the par five 17th are chances to pick up a stroke or two but the par three 16th isn't straight forward and the finishing hole is really tough - especially off the tee - and a par there is always a good score. Only the par four seventh hole played harder than the 18th last year. Thomas Pieters is developing in to something of a frustrating player to follow. He has oodles of talent but he tends to get agitated very easily and he often gets down on himself far too quickly - as he did here 12 months ago when in far better form than he finds himself in this time around. A lot of Irish go out to Vilamoura and they give their lads plenty of encouragement so it's perhaps not surprising to see pod and this year's second favourite, Shane Lowry, have both won the title. Lowry is usually a brilliant scrambler, capable of very low scoring, but whether he's playing well enough this year to be backed so short is highly debatable. He finished seventh in the States at the Wyndham Championship last time out but his scrambling stats have been poor of late and I'm happy to swerve him. To say the venue suits Andy Sullivan is an understatement. He romped to victory here two years ago and but for an ice-cold putter, he'd have defended the title with ease last year after hitting more than 90% of the greens in regulation. In contrast to Harrington who averaged 25 puts per round last year, poor ole Andy averaged over 30! He lost by a stroke. I've been watching him closely of late, anticipating placing a decent wager on him here, but he hasn't impressed. He's missed his last two cuts and I'm happy to leave him out from the start. With only respectable current form and ordinary course form reading MC-16-21-50-50, I'm also happy to swerve Thorbjorn Olesen at around the 20/1 mark. In addition to my each-way pick, Haotong Li, I also really like Joe's fancy Chris Paisley but my main fancy this week is last week's runner-up, Austin Connelly, who but for one bad stroke on the 11th hole, where he did well to make a bogey after finding a hazard, the highly-promising Canadian would have been celebrating more than his 21st birthday on Monday. Connelly, who finished 14th in the Open championship, was very impressive on Sunday and his figures backed that up. He ranked first for Driving Accuracy for the week, as well as second for GIR and eighth for Scrambling. He's clearly a bright prospect and he looked a decent price at [80.0]. At the same price, I've also chanced last year's third round leader, Mikko Korhonen, who has finished ninth and third in his only two visits to date and I've also thrown a few pounds at the neat and tidy Dane, Lasse Jensen, at a huge price.